Developed in Europe by skin care specialists in 1957, this group was set out to create the first liquid shower gel to help eliminate the drying properties of bar soap. With a vision in mind, they created an innovative yet superior product that cleansed the skin and provided important skin conditioning benefits. This specialized formula contained a complex blend of vitamins, botanical extracts along with a very distinctive fragrance that was unlike any other personal care product out there. The ingredients left skin feeling nourished and healthy. This was the birth of Original Spring Green™Gelée. Sixty years later, Vitabath® is still preaching the importance of investing in your skin and as one of the most revered, high-end product lines in the bath and body industry, we have 2 collections that offer you a variety of products and fragrances to help you take care of your biggest asset. Vitabath® Original Spring Green ™ - This is based off of the original Vitabath® formula developed by European skincare specialists in 1957. Our Original Spring Green ™ fragrance is a refreshing blend of patchouli and pine, lightly accented with accords or rosewood. Still our top selling and preferred fragrance of our loyal consumer fan base 60 years later - this fragrance has spanned generations. Vitabath® Orchid Intrigue™ - is our newest addition to the Classic line with an alluring and seductive scent of amber velvet layered with luxurious amethyst orchid, night blooming sambac jasmine, and sugared musk. This is a sensual scent sure to please during a long deserved bath with tons of bubbles. Vitabath® Plus For Dry Skin ™ - A soul soothing fragrance mingling jasmine and fresh violet with spice and soft white musk blends beautifully in this formula that is perfect for anyone looking for extra moisturizing benefits for dry skin. Vitabath® Spa Skin Therapy ™ - is infused with an invigorating ocean-fresh fragrance blending subtle florals and citrus with sandalwood undertones. This formula boasts natural sea kelp and aromatic botanicals that nourish the skin. It is a perfect choice for anyone seeking to soothe both body and spirit . Vitabath® Fresh Citrus Twist ™ is infused with a vibrant fragrance of citrus, lightly blended with hints of jasmine and bergamot. A bright and fresh fragrance to help awaken your senses and help tone and soothe the skin while cleansing. The second collection, introduced in 2011 under the Vitabath® brand is called the Fragrance Collection.generation in mind. Taking special interest in making sure this younger segment knows how important it is to invest in their skin now, rather than later, This brilliant line was developed for the new Vitabath® launched this fresh and playful line that shows off it's fun colors and offers a breath of truly irresistible fragrances. Of course, being true to our history each bottle boasts a 7 antioxidant superfruit complex and vitamin blend of nourishing blend of Vitamins A, B3, B5, C and E which will leave skin feeling moisturized, clean, and vibrant! With products like Moisturizing Body Wash, Moisturizing Lotion and Fragrance Mists, you are sure to find a fragrance or product that we are sure you'll fall in love with. Vitabath® Fragrance Collection Spa Day™ - With cool, fresh therapeutic ingredients like cucumber and lavender, Vitabath®’s Spa Day collection helps both the mind and body relax and de-stress. Vitabath® Fragrance Collection In Bloom™ - A mix of exotic and flirty florals, plus subtle hints of sea breezes, helps to create Vitabath®’s In Bloom collection. Vitabath® Fragrance Collection Fruit Fanatic ™- Made with real fruit and flower extracts, Vitabath®’s Fruit Fanatic line is a delectable fusion of fresh, flavorful fruits – cherries, apples, oranges and grapefruit – with warm vanilla and lily. 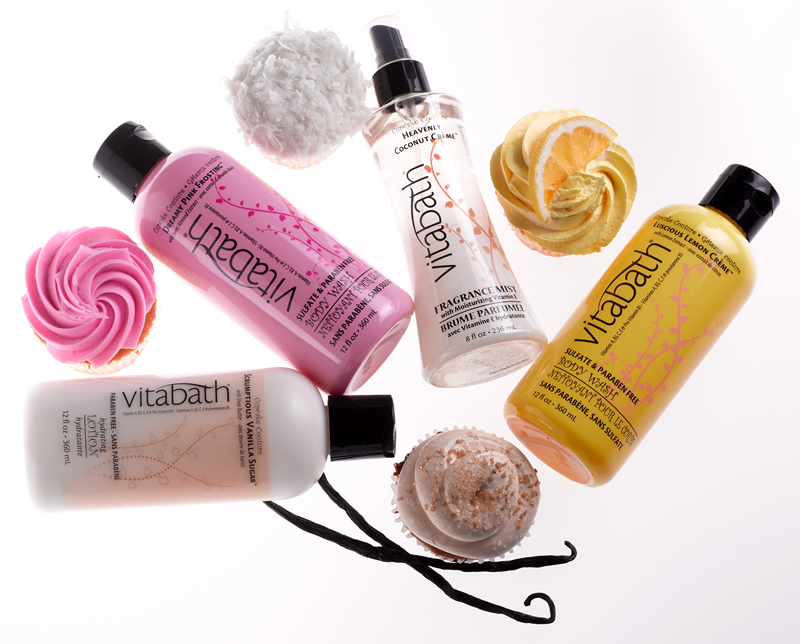 Vitabath® Fragrance Collection Cupcake Couture ™ - One hundred percent guilt free, the playful Cupcake Couture line provides a rich, creamy and sweet flavor palate. Shop our collections and experience the benefits of Vitabath® for yourself or someone special.